Following the arrival of Europeans, tobacco became one of the primary products fueling colonization, and also became a driving factor in the incorporation of African slave labor. The Spanish introduced tobacco to Europeans in about 1528, and by 1533, Diego Columbus mentioned a tobacco merchant of Lisbon in his will, showing how quickly the traffic had sprung up. Jean Nicot, French ambassador in Lisbon, sent samples to Paris in 1559. The French, Spanish, and Portuguese initially referred to the plant as the "sacred herb" because of its valuable medicinal properties. Nicot sent leaves and seeds to Francis II and his mother Catherine of Medici, with instructions to use tobacco as snuff. The king's recurring headaches (perhaps sinus trouble) were reportedly "marvellously cured" by snuff (Francis II nevertheless died at seventeen years of age on December 5, 1560, after a reign lasting fewer than two years). French cultivation of herbe de la Reine (the queen's herb) began in 1560. By 1570 botanists referred to tobacco as Nicotiana, although André Thevet claimed that he, not Nicot, had introduced tobacco to France; historians believe that this is unlikely to be true, but Thevet was the first Frenchman to write about it. 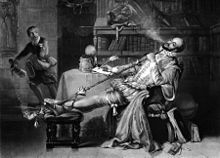 Swiss doctor Conrad Gesner in 1563 reported that chewing or smoking a tobacco leaf "has a wonderful power of producing a kind of peaceful drunkenness". In 1571, Spanish doctor Nicolas Monardes wrote a book about the history of medicinal plants of the new world. In this he claimed that tobacco could cure 36 health problems, and reported that the plant was first brought to Spain for its flowers, but "Now we use it to a greater extent for the sake of its virtues than for its beauty". John Hawkins was the first to bring tobacco seeds to England. William Harrison's English Chronology mentions tobacco smoking in the country as of 1573, before Sir Walter Raleigh brought the first "Virginia" tobacco to Europe from the Roanoke Colony, referring to it as tobah as early as 1578. In 1595 Anthony Chute published Tabaco, which repeated earlier arguments about the benefits of the plant and emphasised the health-giving properties of pipe-smoking. The importation of tobacco into England was not without resistance and controversy. Stuart King James I wrote a famous polemic titled A Counterblaste to Tobacco in 1604, in which the king denounced tobacco use as "[a] custome lothsome to the eye, hatefull to the Nose, harmefull to the braine, dangerous to the Lungs, and in the blacke stinking fume thereof, neerest resembling the horrible Stigian smoke of the pit that is bottomelesse." That year, an English statute was enacted that placed a heavy protective tariff on tobacco imports. The duty rose from 2p per pound to 6s 10p, an increase of 4,000%, but English demand remained strong despite the high price; Barnabee Rych reported that 7,000 stores in London sold tobacco and calculated that at least 319,375 pounds sterling were spent on tobacco annually. Because the Virginia and Bermuda colonies' economies were affected by the high duty, James in 1624 instead created a royal monopoly. No tobacco could be imported except from Virginia, and a royal license that cost 15 pounds per year was required to sell it. To help the colonies Charles II banned tobacco cultivation in England, but allowed herb gardens because doctors said it had medicinal purposes. Tobacco was introduced elsewhere in continental Europe more easily. Iberia exported "ropes" of dry leaves in baskets to the Netherlands and southern Germany; for a while tobacco was in Spanish called canaster after the word for basket, canastro, and influenced the German Knaster. In Italy, Prospero Santacroce in 1561 and Nicolo Torbabuoni in 1570 introduced it to gardens after seeing the plant on diplomatic missions. Cardinal Crescenzio introduced smoking to the country in about 1610 after learning about it in England. The Roman Catholic Church did not condemn tobacco as James I did, but Pope Urban VIII threatened excommunication to anyone smoking in a church. In Russia, tobacco use was banned in 1634 except for foreigners in Moscow. Peter the Great—who in England had learned of smoking and the royal monopoly—became the monarch in 1689, however. Revoking all bans, he licensed an English company to import 1.5 million pounds of tobacco per year, the monarchy receiving 28,000 pounds sterling annually. Although Nicotiana suaveolens is native to Australia, tobacco smoking first reached that continent shores when it was introduced to northern-dwelling Indigenous communities by visiting Indonesian fishermen in the early 18th century. British patterns of tobacco use were transported to Australia along with the new settlers in 1788; and in the years following colonisation, British smoking behaviour was rapidly adopted by Indigenous people as well. By the early 19th century tobacco was an essential commodity routinely issued to servants, prisoners and ticket-of-leave men (conditionally released convicts) as an inducement to work, or conversely, withheld as a means of punishment. In the Eastern United States, gold and silver were scarce, which made it harder for colonists to trade with Native Americans. 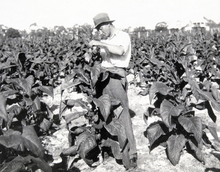 The cultivation of tobacco in the Chesapeake area was essential to solving this problem. Without silver and gold to trade to the Chesapeake tribes, colonists traded tobacco for essential natural resources. This started in the 1620s. Tobacco was also used as a currency in the colonies, used for paying fines, taxes, and even marriage licenses. With the profitability of the land rapidly increasing, it was no longer was economically viable to bring in indentured servants because they were promised physical benefits at the end of their tenure. What the plantation owners wanted was workers who could legally not be paid and would be able to work long hours in the hot sun. Their conclusion was to turn to another institutionalized practice: slavery. The demand and profitability of tobacco led to the shift in the colonies to a slave-based labor force. Tobacco is a labor-intensive crop, requiring lots of work for its cultivation, harvest, and curing. These tasks were carried out during the colonial period by slaves. After sweating, the next step was sorting. Ideally, all the tobacco should be in a condition described by cropmasters as "in case". This meant that the tobacco had absorbed just the right amount of moisture; it could be stretched like leather, and was glossy and moist. If tobacco were too damp, it would rot in transit; if too dry, it would crumble and be unsalable. There were also tobacco plantations in Tennessee, like Wessyngton in Cedar Hill, Tennessee. Nazi Germany saw the first modern anti-smoking campaign, the National Socialist government condemning tobacco use, funding research against it, levying increasing sin taxes on it, and in 1941 banning tobacco in various public places as a health hazard. ^ e.g. Heckewelder, History, Manners and Customs of the Indian Nations who Once Inhabited Pennsylvania, p. 149 ff. ^ "They smoke with excessive eagerness ... men, women, girls and boys, all find their keenest pleasure in this way." - Dièreville describing the Mi'kmaq, c. 1699 in Port Royal. ^ Tobacco: A Study of Its Consumption in the United States, Jack Jacob Gottsegen, 1940, p. 107. ^ California Natural History Guides: 10. Early Uses of California Plant, By Edward K. Balls University of California Press, 1962 University of California Press. ^ "Economic Aspects of Tobacco during the Colonial Period 1612-1776". Tobacco.org. Retrieved 17 February 2017. ^ a b c d e f g h i Ley, Willy (December 1965). "The Healthfull Aromatick Herbe". For Your Information. Galaxy Science Fiction. pp. 88–98. ^ "History of Tobacco". Boston University Medical Center. Retrieved 17 February 2017. ^ "A Counterblaste to Tobacco". University of Texas. Retrieved 17 February 2017. ^ a b "Tobacco: Colonial Cultivation Methods". US National Park Service. Retrieved 17 February 2017. ^ a b c d e f "Tobacco: Colonial Cultivation Methods - Historic Jamestowne Part of Colonial National Historical Park (U.S. National Park Service)". ^ Van West, Carroll. "Wessyngton Plantation". The Tennessee Encyclopedia of History and Culture. Tennessee Historical Society and the University of Tennessee Press. Retrieved 3 March 2018. ^ A History of the United States since the Civil War Volume: 1. by Ellis Paxson Oberholtzer; 1917. P 93. ^ 'The Republican Campaign Textbook, 1880.' Statistical Tables, P 207. ^ "Tobacco Control Act". US Food and Drug Administration. Retrieved 17 February 2017. ^ Colin White (September 1989). "Research on Smoking and Lung Cancer: A Landmark in the History of Chronic Disease Epidemiology". The Yale Journal of Biology and Medicine. 63 (1): 29–46. PMC 2589239. PMID 2192501. ^ JM Appel. Smoke and Mirrors: One Case for Ethical Obligations of the Physician as Public Role Model Cambridge Quarterly of Healthcare Ethics, Volume 18, Issue 01, January 2009, pp 95-100. ^ Doll, Richard; Hill, A. Bradford (30 September 1950). "Smoking and carcinoma of the lung. Preliminary report". British Medical Journal. 2 (4682): 739–48. doi:10.1136/bmj.2.4682.739. PMC 2038856. PMID 14772469. ^ Doll, Richard; Hill, A. Bradford (26 June 1954). "The mortality of doctors in relation to their smoking habits. A preliminary report". British Medical Journal. 1 (4877): 1451–55. doi:10.1136/bmj.1.4877.1451. PMC 2085438. PMID 13160495. ^ Doll R, Peto R, Boreham J, Sutherland I (2004). "Mortality in relation to smoking: 50 years' observation on male British doctors". BMJ. 328 (7455): 1519. doi:10.1136/bmj.38142.554479.AE. PMC 437139. PMID 15213107. ^ "TOBACCO: End of the Tar Derby". Time. 15 February 1960. ^ Zaitlin, Milton (1998). "The Discovery of the Causal Agent of the Tobacco Mosaic Disease" (PDF). In Kung, S. D.; Yang, S. F. (eds.). Discoveries in Plant Biology. Hong Kong: World Publishing Co. pp. 105–110. ISBN 978-981-02-1313-8. Benedict, Carol (2011). Golden-Silk Smoke: A History of Tobacco in China, 1550-2010. Brandt, Allan (2007). The Cigarette Century: The Rise, Fall, and Deadly Persistence of the Product That Defined America. Burns, Eric (2007). The Smoke of the Gods: A Social History of Tobacco. Philadelphia: Temple University Press. Collins, W.K., and S.N. Hawks (1993). Principles of Flue-Cured Tobacco Production. Cosner, Charlotte (2015). The Golden Leaf: How Tobacco Shaped Cuba and the Atlantic World. Vanderbilt University Press. Gately, Iain (2003). Tobacco: A Cultural History of How an Exotic Plant Seduced Civilization. Grove Press. ISBN 0-8021-3960-4. Goodman, Jordan (1993). Tobacco in History: The Cultures of Dependence. Hahn, Barbara (2011). Making Tobacco Bright: Creating an American Commodity, 1617-1937. Johns Hopkins University Press. 248 pages; examines how marketing, technology, and demand figured in the rise of Bright Flue-Cured Tobacco, a variety first grown in the inland Piedmont region of the Virginia-North Carolina border. Kluger, Richard (1996). Ashes to Ashes: America's Hundred-Year Cigarette War. Schoolcraft, Henry R. (1851–57). Historical and Statistical Information respecting the Indian Tribes of the United States. Philadelphia. Wikimedia Commons has media related to Tobacco. This page was last edited on 20 March 2019, at 14:33 (UTC).